Elmet is a leading global provider of high-quality potassium doped molybdenum (HCT) wire products and the only US owned and operated producer. All our wire products are manufactured in Lewiston, Maine USA. Elmet has a 90-year legacy dating back to our history as part of Royal Philips where we manufactured wire and lighting filaments for Philips Lighting. We manufacture and stock common sizes of our molybdenum, molybdenum potassium doped HCT wire and tungsten wires. Elmet manufactures wire as small as 7/10,000ths of an inch (0.0007″). Wire is typically sold on a per km basis (fine wire) and a kg basis (heavy wire). Elmet produces four types of molybdenum wire – Pure, HCT (potassium-silicate doped), MoLa (lanthanum oxide doped), and MB (molybdenum-tungsten alloy—various compositions). Diameter sizes range from less than 0.001 inches to 0.187 inches. Pure molybdenum – used in standard applications for the production of mandrels, supports, furnace elements, furnace windings and formed parts. HCT and MoLa are doped products that have higher recrystallization temperatures. For diameters below 0.090 inches, they exhibit better ductility after recrystallization. These products are used in more demanding applications, such as halogen lamp leads, to provide superior weld ability and glass-to-metal seal properties. Application temperature limits for MoLa exceed those of HCT, and MoLa finds applications where the limits of HCT are reached. MB is an alloyed product of molybdenum with tungsten (typically 50:50, with others available upon request). It combines the properties of tungsten and molybdenum to offer blended properties with unique resistance and oxide color capabilities that find applications in automotive and aircraft windshield heating (defrosting). Wire diameters are generally expressed in terms of inches or mils (thousandths of an inch). For thin wires from 0.001 inches to 0.020 inches, the size of the wire is measured by weight per unit length. That is, the weight expressed as milligrams of a 200mm length of wire. The standard diameter tolerance is ± 3% of the weight measurement. For mandrel applications, the tolerance is normally ± 1%. 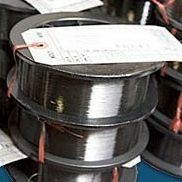 Tensile strength for molybdenum wire is usually expressed in grams per milligram weight of a 200-millimeter length (or) g/mg/200 mm. The normal range of values is 40 to 60 grams. In general, as tensile strength increases, wire straightness decreases. The measure of the straightness of a metal wire is obtained by cutting a ten-inch long piece of wire and allowing it to lie on a flat clean surface. The maximum deviation from a straight line along its length is the quantitative measure of its straightness. In general, as the degree of the straightness increases, tensile strength decreases. Wire is free of scratches, kinks, and distortions insofar as they are harmful to the intended use of the product. The surface finish is supplied in the black, as drawn condition, where drawing lubricants and oxides are retained on the surface, or in the cleaned condition by firing in hydrogen or Electro-chemical etching. Wire is spooled on clean, defect-free spools. For very large diameters, wire is self-coiled. Spools are level filled without piling near flanges. Elmet ensures the outer end of the wire is properly marked and attached securely to the spool or self-coil.